Just a casual but comfortable outfit to work from home. I last wore this tank on boxing day last year, it's been almost a year since I wore it last! But I like the print, the super soft fabric, and how light it is for summer. It will stay in my wardrobe for the moment, and I'll try wear it more often to justify keeping it. This bag I have no trouble wearing a lot - it's the perfect size for the essentials. Rebecca Minkoff have a "holiday hook-ups special" on at the moment, every day there is a new sale or discount. Today's deal is 40% off selected items with the code 'MERRYMINI'. If I hadn't recently gotten a bag for my birthday, I'd be getting the yellow one, isn't it beautiful? Last worn: grey floral singlet, printed denim shorts, Havaianas, Rebecca Minkoff silver mini MAC. And it's been a year and a half since I last wore this top...I definitely have too many clothes in my wardrobe! I've been thinking about pairing the top and skirt together for a while. When I bought the set, I didn't imagine I'd ever wear them together, but have been inspired by the way Sam from Style of Sam rocks the vintage pieces her Grandmother gives her, I thought I've give it a go and wear the pieces together the way they were intended. Apart from the top being a bit uncomfortable and moving around a lot, I think it looked okay. What do you think? Linking up with Fashion Informant, Spotlight Weekly linkup, Three-fer Thursday, What I Wore Wednesday today. 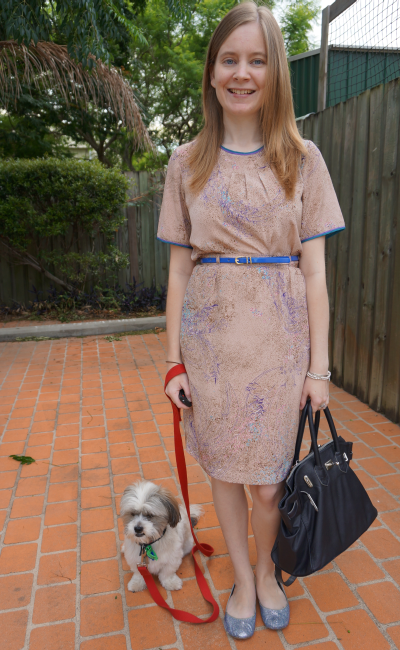 Last worn: vintage printed top, blue skinny belt, vintage printed skirt, glitter flats, Marco Tagliaferri bag. I really like the top and skirt together! I almost thought they were a dress. The cobalt belt really compliments them! Your work look is superb. Funny thing I had to look at the picture several times after reading your text as i could have sworn it was a dress. For me it's kind of difficult to imagine NOT pairing these two together. Very cute outfits! Love the first bag! I love the top/skirt combo - I thought it was a dress! That yellow bag is to die for - wonderful (and a happy belated birthday!). Cooper is so sweet. Aww, thank you! My birthday is coming up, I just know what hubby bought me already as I asked for it, haha! So I've just discovered your blog, I'm sat here in a big jumper, jeans, slippers and have the hearing on. I'm slightly jealous right now. Your dog is adorable, and that dress is gorgeous! Haha speaking of too many cloths! I also have things I haven't worn for more gab 6-12 months!!! Yikes!! Do I have too many cloths too?!? I love that dress you worn for work! The colour really compliments your complexion well! Jealous that it's so warm where you are! I love my RM Mac Mini too... such a great little bag! the top and skirt look great paired together mica! i love that rebecca minkoff bag. it looks great with all kinds of outfits. love your tank in the first pic. cooper is just too cute! I love that top and skirt together in the second outfit - looks like a lovely dress! haha im the same, my wardobe is so big i have stuff i havent worn in a year! but im loving the top, you did a great job styling it! wow it looks like it's getting warm up there ;) i love the yellow minkoff bag, been toying with the idea i need to start carrying smaller bags in general, love the vintage outfit mica, i think it looks more like a one piece the way you've worn it here, probably the belt. i love it! You should get the RM! They are my new bag addiction. And I'm not even sorry! haha! I like that navy colour for a bag! I think your vintage outfit is pretty!! And since I woke up to morning temperatures well below the freezing point, I'm a little jealous of your sunny and warm weather! Your bags are always gorgeous ! And I love me some mini MAC, I have a green one and love it, I want more ! They are very addictive! I now have 3! i just love when you make your outfits look cute on you! Your first look is so cute and you had a little matchy-match with your pop. And i just adore your top and skirt! And that metallic bag just caught my eye! Two very different outfits :-) But doggie is ever present, woop! i love the flower printed tank and the dress in the second look is gorgeous! love the top skirt combo and also that gorgeous bag! Wowwww i love the dress in the second picture!! Ad I really want to buy that RM bag! I love both outfits you have, but my favorite is the 2nd one.. The one that you wore to work. I love the touch of blue with the belt and the blue shoes! I love your dress. Super cute. I found you via the Fashion Informant. I would love if you joined my Love Your Look Link Up! I was a bit surprised when you say "what I wore for work" because you look so young!!!! my go to work was so totally the opposite as it was so mind blowing cold here this week. Just got an idea for a shared post what I wore today from different climates, It would be cool to show the extreme weathers. the bottom outfit looks AMAZING! def a great move to pair the matching top & bottom together. Love that last outfit! The blue details are everything! The print tank is great. You could dress it up or down. 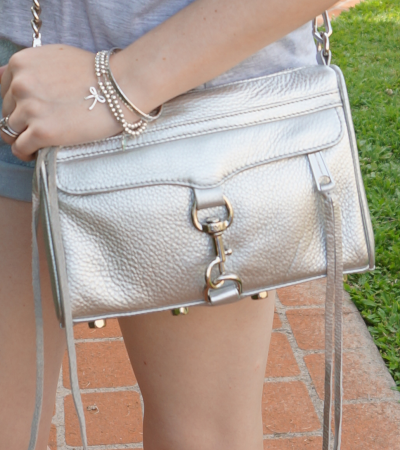 Mica, that metallic bag is just fabulous! I love it!! Thanks for sharing with Three-fer Thursday.